One of these days I will get back to posting craft tutorials, but I wanted to share photos of a beautiful family heirloom that I now own. Recently my Grandmother made the difficult decision to sell my father's childhood home. Her new place is small, so she asked that the family come together and choose pieces that would mean something to each of us. I was able to select this antique display case that belonged to my Great Grandmother. My husband and I decided to place the case in our living room and fill the inside with a bell that I purchased in the Czech Republic, some pottery we received for our wedding, and some other mementos from my grandmother. I just love that we are able to see all of these special items every day because of the prominence of the display case in our home. The display case also has a functioning drawer at the bottom where I placed tablecloths, place mats, cloth napkins, and other items that I didn't have a place to put before! When we first opened the display case, I swore that I could smell my Great-Grandmother's home. It's funny how scent is so tied to memory! I will enjoy thinking of my Grandmother and Great Grandmother every time I look at this piece, which is my favorite part about family heirlooms! This piece will certainly be a much-loved item in our home for years to come. 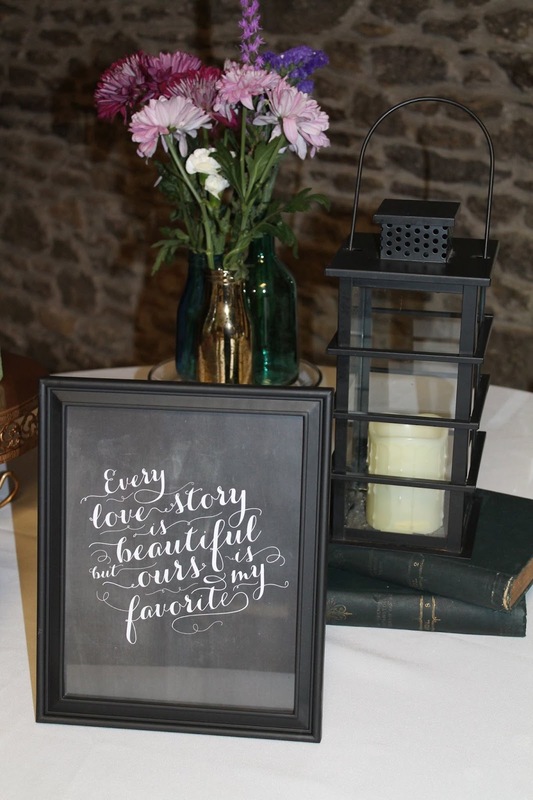 Do you have a family heirloom that you love? Please share with me in the comments section! When J and I decided to get married we knew we wanted to have an intimate ceremony. 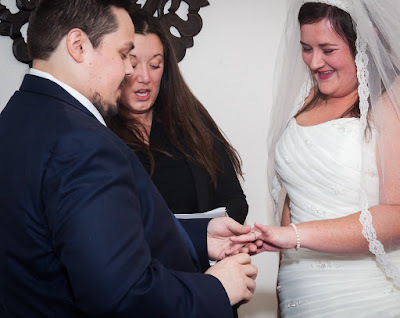 That led us to exchanging our vows in front of only 12 people in our living room one Saturday afternoon in December. We had just moved in to our new home two weeks before the wedding and after spending the summer renovating it. It was special for us to have such an easy ceremony in our own home. 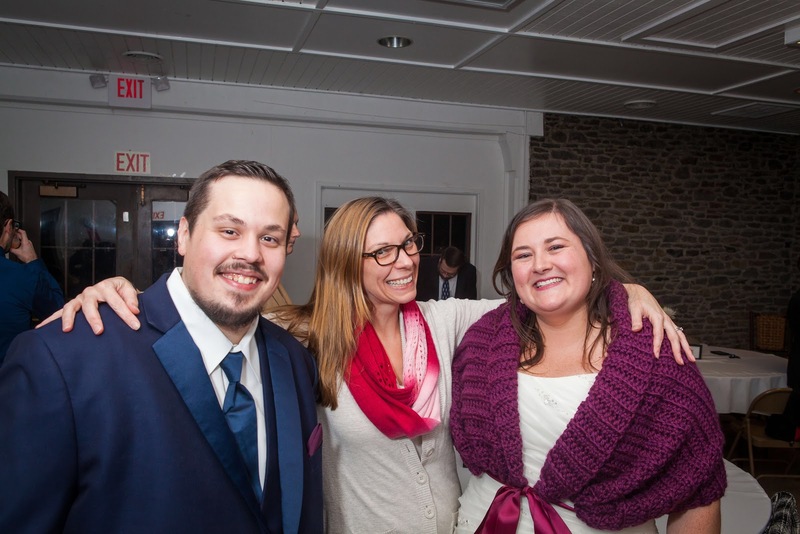 We wanted to invite more of our friends and family to participate so we hosted a cake and punch celebration at the lodge at George Rogers Clark Park in Louisville, Kentucky. The lodge itself is pretty rustic, but with our theme and the amazing help of our awesome friend Julee (DIY Louisville), the space was truly transformed. 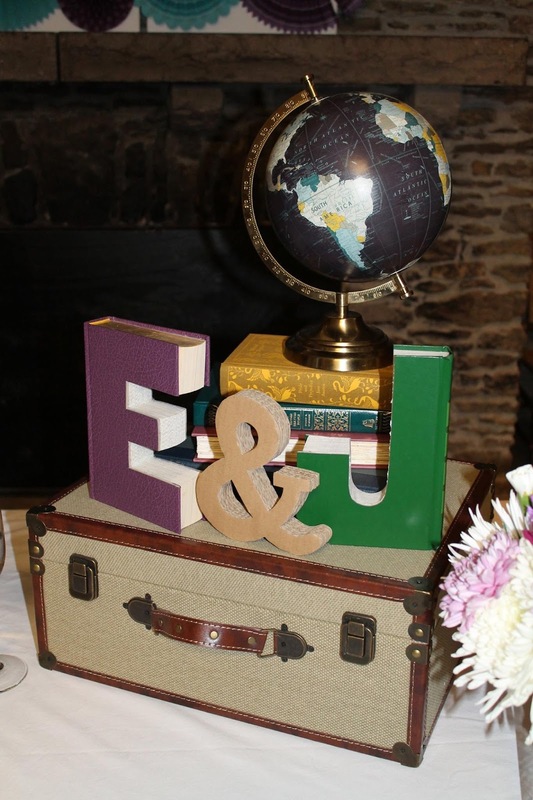 We wanted to have a book/library themed wedding and Julee did not disappoint. Julee used our book theme with some beautiful jewel toned colors (blue, magenta, purple, and green) and splashes of gold to transform the space. She displayed frames with quotes along with stacks of books and also used small vases filled with flowers that we picked out from our local Kroger the day before. 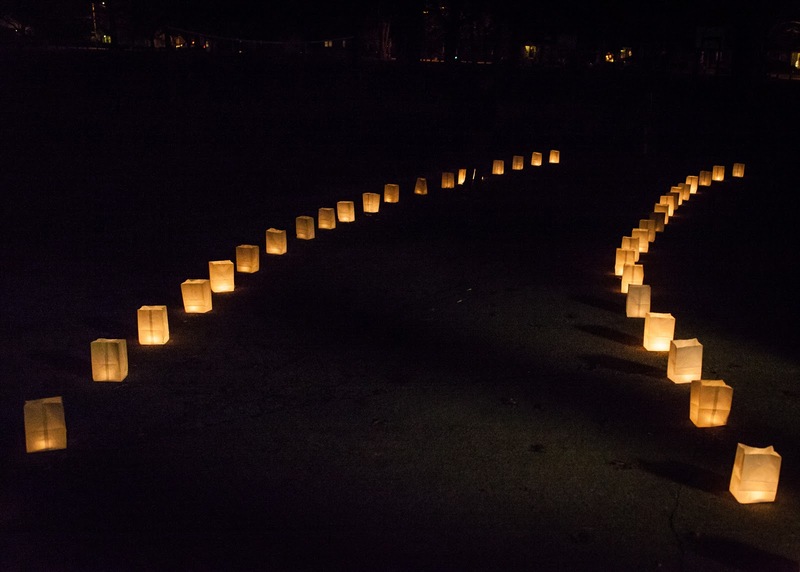 She even surprised us for the evening reception with a walkway lined with luminaries. I really wish I had more photos of all the amazing details! 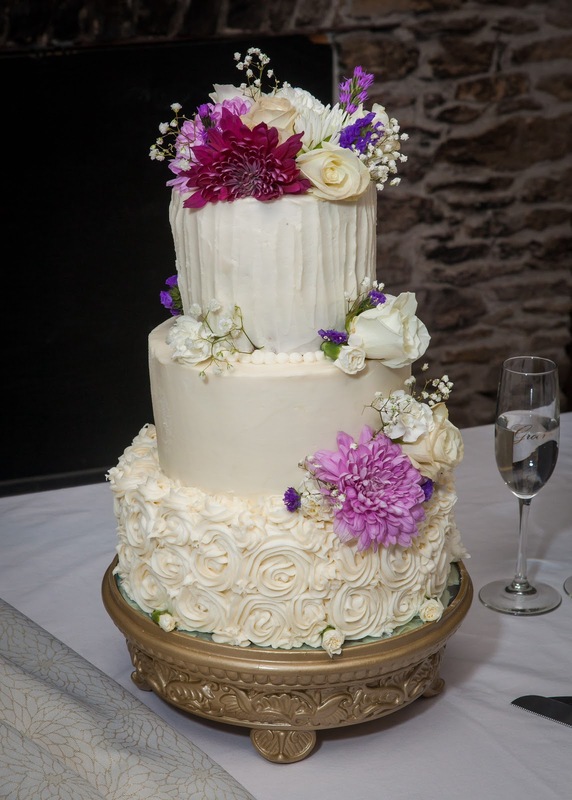 We were also able to coordinate with the cake baker to use the same flowers on our cake that we used for my bouquet and the reception floral arrangements. 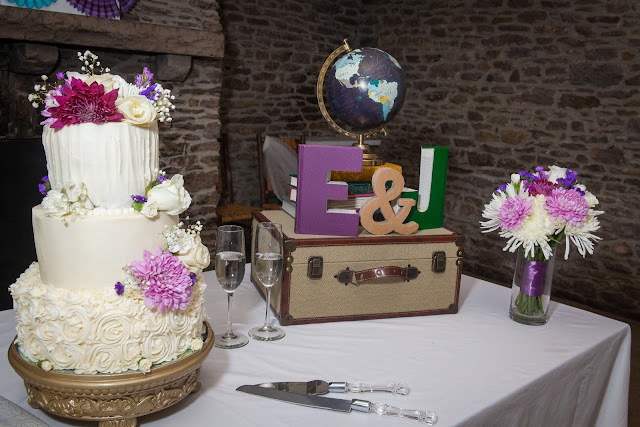 Our cake was made by Erin of Sugarbites and each of the three layers had a different flavor, and they were all delicious! The cake had strawberry on top, bourbon chocolate in the middle, and Italian cream cake on the bottom, all with buttercream icing! Sooo good! I will definitely post more of the details soon, including our vows, and some of the special crafty things that we created for our big day! 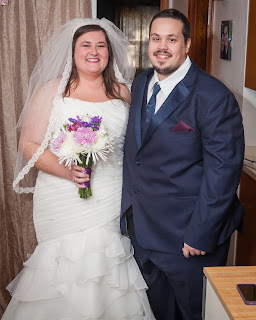 I was so excited on my last post (July 2015) about planning our wedding and all the potential craft projects I could share along the way, and here it is January 2016 and our wedding has come and gone! 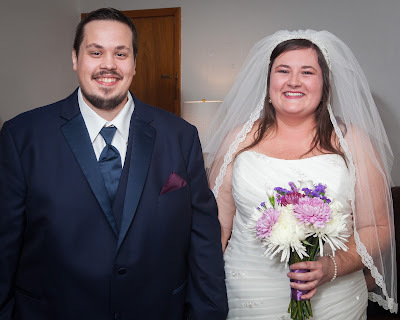 We were married in December 2015. 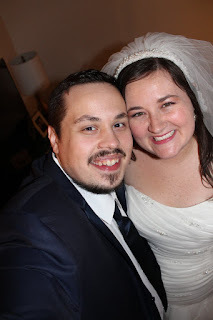 I even found a draft blog post I started in September with our save the date. Oops!!! Happily, it was a beautiful day filled with so many wonderful people. Even my friend Julee from DIY Louisville was there, playing a big part in our special day as our official reception planner and decorator. She killed it with our book-themed wedding. I promise to post photos of the fabulous decor soon! For now, here are some newlywed shots. Craft E Magee is the one-of-a-kind handiwork of Elizabeth Magee, a lifelong Louisvillian and crafter. Craft E Magee has been featured in regular television craft spots on WDRB in the Morning and judged crafts at the Kentucky State Fair. She likes to blog about her creative projects and share tips, tutorials, and free printables. Have a look around! Make your own Derby Hat!